The Russian and Chinese veto of the UN draft resolution on Syria is condemned in the Arab, Turkish, Israeli and even Russian press, finding support only in the official Syrian and Chinese media and pro-government newspapers in Syria's ally, Iran. Some Arab newspapers criticise UN and Arab League efforts, and support a French proposal to aid the Syrian opposition through an informal international grouping. Syrian and Iranian papers denounce the resolution as a Western ploy and the Arab League as a US "pawn". Chinese papers back Beijing's actions as defence of non-interference in internal affairs. Many Arab papers see the superpower confrontation over Syria as the start of a new Cold War by proxy, although one commentator says the Russian and Chinese positions could change. "With the killing of thousands of Syrians and the systematic terror carried out by Assad's forces and his lawyers Russia and China, who resorted to the Security Council to use their veto, the Arabs today have no choice but to shun the inaction of Arab League Secretary-General Nabil el-Arabi... The Arabs must support the French president's proposal to form a group of friends of the Syrian people, as it has become clear that fear is inherited in Syria". "The Russian and Chinese stance is clothed in shame and disgrace. 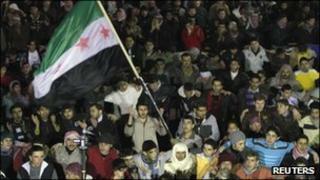 Moscow and Beijing insist on dancing on corpses and disregarding the massacres by Assad's regime. Vladimir Putin and his like will go to the rubbish heap of history haunted by the curses of angry Arabs... The Russian and Chinese people should speak out against the veto that gives a license to kill... But we doubt that this will happen." "The double Russian-Chinese veto at the UN Security Council... is an important turning point in international relations and the start of a new page in a Cold War of a different nature." "Both the Syrian leadership and the Syrian people are aware that the parties attacking Syria have been left confused after the second double veto by Russia and China at the Security Council. They are also aware that they will not find a way to continue their dirty tricks other than by escalating their media campaign through high-sounding rhetoric and false stories of fighting and defections in the Syrian army, which exist only in their sick minds." "This veto shows that that the West's attitude towards Syria is not to assist its people but to overthrow its government, which is completely contrary to the people's wish. The Arab League's cooperation with America in this field has further revealed the face of this US pawn... The veto also shows that Obama's policy of improving ties with Russia and China has failed." "Re-energising the Arab Initiative and the committee of Arab observers is the only way to stop the crisis from exploding and to resolve the crisis within the Arab arena... We have to affirm an important truth, which is the failure of the military and security solutions in Syria just as they failed in Yemen, Libya, Tunisia and Egypt. There is no real solution except a political solution and we hope that the regime takes this seriously." "The Syrian crisis has entered a new phase of security and political escalation after Russia and China used their veto at the UN Security Council... With the expectation of more bloodshed and resistance, civil war has unfortunately taken a step closer to reality. The veto undermines the role of the UN and the international community at this stage, and it is becoming impossible to stop the killing machine in the Syrian city." "The situation in Syria will not be corrected by killing people and imprisoning all the dissidents... We must also understand that the interests of states change, and today's veto may not last long." "Bashar al-Assad has turned into the proverbial 'suitcase without a handle' - heavy to carry but a shame to give up. Hence all the wavering in Russia's position... After all, Syria is one of the few strategic partners Russia has left in the region, and a not insignificant buyer of our arms. In that respect Moscow's logic is clear. Yet it is equally clear that Assad's prospects of a long and happy presidency are virtually nil, and then it will be extremely difficult to build relations with the new authorities. It is not for nothing that the Americans have already openly stated that now the bloodshed in Syria will be on Russia's and China's hands." "The Syrian government should attach importance to the people's aspirations for social change, and the current situation is unsustainable. The Syrian opposition should understand that, if foreign countries intervene militarily, several generations in Syria will pay the price for it. The Arab League and the Gulf Cooperation Council should understand that avoiding foreign armed intervention will be conducive to the overall interests of the Arab world. The US and Europe should also understand that if an out-of-control situation in Syria causes the situation in the entire Middle East to go out of control, hits energy supplies and breeds extremist forces, this will benefit no one." "The principle of reciprocal non-interference in internal affairs is still the last line of defence for disadvantaged developing countries to safeguard their right to exist. The veto by China and Russia safeguarded the interests of vulnerable groups in the world and also prevented the UN from falling into injustice once again." "While the West is having difficulty in determining a policy to end the bloodshed in Syria, the Assad regime is very pleased with the support it has received from Russia and China.... I wish Assad would not let his country be the point of confrontation between Sunni and Shiite Islam and accept mediation efforts so that 7,000 people would not die. But it is certainly too late." "The Russian and Chinese veto of the UN Security Council resolution against Syria is in fact a licence for Syria's president to continue slaughtering his citizens with impunity. The veto makes it eminently clear how weak the international community is when it comes to people who are trying to free themselves from the burden of a dictator and who dream of democracy and a fair life... Their move makes the two superpowers full partners in the acts of murder."